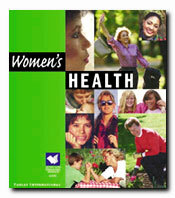 Instant handouts on significant women's health issues. This collection of articles and tips covers a variety of topics related to a woman's health and well-being. The focus is on both disease and injury prevention, as well as common physical and mental wellness issues. This kit is one section of the more comprehensive Family Health Kopy Kit, available only in CD-ROM format.